Soron Stoneblood is a battle weary youth. Not yet twenty he has faced more battles than most will in a life time. Soron wants change, but to do that he face his greatest tests yet. 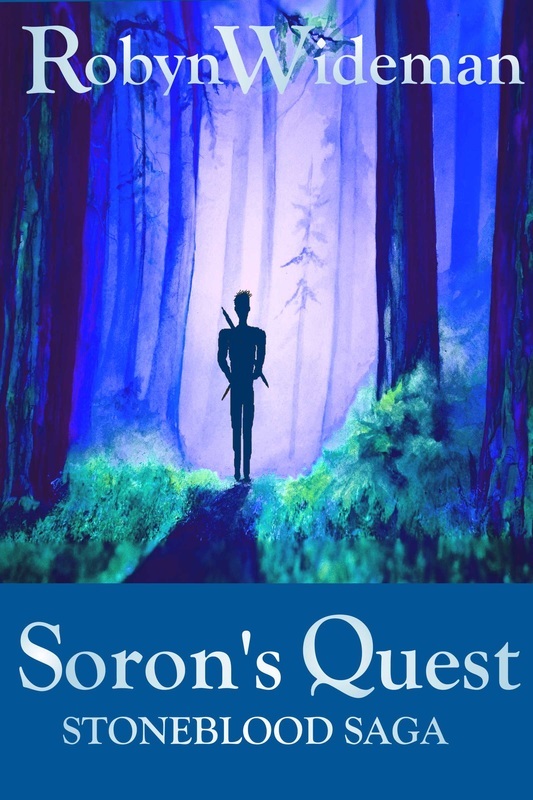 Join young Soron on his quest for a new life, one filled with more adventure and danger than he ever dared to think of. Soron stood sword in hand, waiting for the beast to attack. He had been travelling for weeks searching for a source of hexin. Hexin, a rare mineral was a source of fascination for young Soron. Its unique properties blended well with iron to make beautiful art. But hexin was rare. So Soron searched far and wide, until at last he found a large outcropping of the magnificent material deep in the Glug Mountains. The problem was the mineral outcropping was close to the lair of a snow yeti. The snow yeti was a reclusive predator that roamed the high mountain ranges of Northern Solotine. Normally the creatures preyed on sheep, goats and once in a while one would come down from the mountains and steal a farmer’s cow. During the lean winter months yeti’s likes to find bear dens and attack the hibernating animals. Today there was a yeti hunting Soron. The beast was beyond the tree line, stalking Soron. But a shift in the wind gave its presence away. The strong odor of the yeti contrasted with the clean crisp mountain air tinged with the light floral scent of high valley wild flowers which grew haphazardly throughout the area. Soron had no interest in fighting the beast, he would gladly leave the reclusive monster alone, but something told him that the creature did not feel the same way. While most of the wild animals of Northern Solotine recognized people as an enemy to be feared, yeti were not in that category. They feared nothing and likely looked upon Soron as a suitable snack. Branches snapped and broke, or were brutally brushed aside as the beast blasted out of the bush. Soron turned his body slightly bringing himself in line with the charging beast. So much for letting the beast live, thought Soron. The beast seemed determined to make a meal out of him. As the large creature closed in him, Soron swung his sword. Instead of attempting to duck his attack the yeti simply raised its arm letting Soron’s blade cut into its arm while it came and delivered a blow of its own. The heavy clawed paw slammed into Soron’s chest sending him soaring through the air. Soron landed with a heavy crash. His ribs felt they had been rearranged and breathing was now difficult. Soron looked up at the oncoming yeti. So far the mammoth killer was winning this battle, but Soron was no ordinary man, he was a northerner and the son of the mighty chieftain Theron. Theron was one of the rare and mighty northerners who were descendants of giants. The bloodlines were not as strong as generations before, but the extraordinary size and strength was still a marker of the unique heritage. Still even with his exceptional size for a man, Soron was in trouble. The yeti was barely wounded and Soron could feel at least one broken rib. His mobility and endurance would be severely limited from this point on. Soron focused, rising to one knee. He waited until the yeti was within striking distance before pushing off the ground, pivoting as he lifted. Swinging his razor sharp sword in a deadly arc intended to decapitate the attacking yeti. Having already felt the stinging touch of Soron’s blade the yeti wisely jumped back instead of trying to block the deadly blow. The tip of Soron’s blade slipped harmlessly in front of the monsters neck. The yeti gave a loud rumbling growl. It did not like the level of resistance Soron was putting up. Despite his outburst of bravado, Soron knew he was in trouble. His breath was coming slowly. His wounded ribs were sapping his energy fast. But his own words were giving him ideas, if he was going to end up as yeti lunch, the very least he would do was make sure he gave the beast the indigestion he had promised. Soron lowered his sword slightly, and stumbled forward. The beast reacted quickly. It tried to take advantage of Soron’s weakened state by launching itself as him in a quick rush, before Soron could swing his sword in a defensive maneuver. The rush worked, within fractions of a second the beast was too close for Soron to swing his sword around. But Soron’s stumble was a feint; he had no intentions of swinging his sword again. This time when the beast rushed forward, Soron pushed himself forward using his faked stumble to gain momentum. When he was almost about to collide with the beast he grabbed his sword blade, held it like a spear and thrust it deep into the yeti’s belly. The blade went deep. Slicing into the large predator until the tip of the blade protruded from the beasts back. The yeti howled in agony, its dying scream could be heard for miles. Soron stood against the animal’s chest, Soron could feel the beast’s claws against his back, where they had sliced through his leather tunic. But the monsters claws no longer tore into his back, nor did the animal move. Exhausted, it took Soron a moment to realize the monster was dead. The only thing holding the large beast up was Soron’s weight against it, leveraged by the large sword running through its stomach. Soron slid to his right, pushing sideways on his sword as he did. The dead Yeti collapsed on its side. Soron slowly sat down next to his vanquished foe. He felt no jubilation or exhilaration from his victory. He was simply content that he would live to see another day. Not yet twenty, Soron was a veteran warrior, one tired of bloodshed. There had been a time when Soron relished battle, he had enjoyed the rush of adrenaline that accompanied having an enemy attack. The test of manhood had intrigued his as a boy. But as he grew older, the intrigued died off, few if any of his enemies had the skills and strength to defeat him. As word of his exploits grew so did the number of warriors that wanted to test themselves against the young prodigy. Soron could hardly stay in his father’s town longer than a week without some warrior coming to test him. Other northern tribes attacking Amradin, the small city home to his father’s tribe, was also a constant source of battle. Theron, his father, was a mighty chieftain and now some were proclaiming him King of the North. Theron saw this as a way of unifying the local tribes, a way to bring peace to the volatile region. Soron knew better. Peace was not the northern way. War was in their blood, proclaiming a king might bring together the local tribes but it would also create a prize for the large tribes to the farther north to reach for. Creating a kingdom in the north would not bring peace; it would bring battle on a larger scale. Soron could not see a way to convince his father to end this folly. Instead he wandered the north searching for the rare minerals he could use to make jewelry. His search for hexin was a success, if not for the minor inconvenience of a yeti attack. As Soron sat there beside the corpse of the once mighty beast, he reflected on his own past and his future. Was this the way he was to die, wandering the mountains alone, victim to one of the many predators that roamed the harsh land. It was ironic, Soron thought; I came out here to avoid battle. Yet here I am once again about to tend to battle wounds. Perhaps it wasn’t just the people of the north that he needed to avoid. The very land itself was a harsh enemy, filled with monsters and predators content to try eating him. Perhaps he should find a new home, one not so filled with violence. But that was a thought for another day. First he had to make sure he survived this one. Soron stopped his overthinking and concentrated on his current situation. Gently taking his tunic off, he assessed his wounds. Lightly he ran his fingers over his ribs, the bruised area was large and at least one was broken. As long as the broken ribs didn’t cause any other injuries he would live. He would have to return to Amradin to see a healer, but that was a small price to pay for good health. With a small smile he consoled himself, at least he would not be returning empty handed. He had a whole yeti to carve up for meat and more importantly had found a source of hexin. Just thinking of the beautiful items he could create with the rare mineral made Soron happy. Yes, returning to Amradin would be okay. The journey back to Amradin was slow and challenging. His wounded ribs made travel difficult, his determination to bring back the yeti meat and his small supply of hexin made travel even harder. He made a travois, two long poles lashed together with his supplies and cargo between them, it helped but between the extra weight and his wounds travel was still difficult. Normally he would have made it back from the mountains in less than a week, as he was now it had been a full twelve days. Dropping his gear off at his room in the great lodge, Soron headed to the healer. The sooner he got his ribs looked at the better. Holti Skalkson was an a’kil healer. The a’kil were a magical race and their bloodlines were thick with magical abilities. Holti used his magical abilities to augment his healing skills. He was without doubt the best healer in the north to Soron’s knowledge. Solotine was a rare land, centuries ago the land had been home to many races and breeds. A’kil, giants and other exotic magical beings from the far western lands called the harsh land home. But as the causians became more powerful the magical beings and breeds faded out. Giants were almost never seen, most of the a’kil were gone and those who were left often hid their nature. Now most of the people of Solotine feared magic. Even in Amradin, where their leader was a descendant of giants, and a’kil as his father liked to remind him, the people had a healthy distrust for magic. Holti was one of the few magical users who was accepted, simply because his gifts were so valuable and the fact he was exceptionally discreet about when he used magic to heal. Today he was using magic. “What the hell did you do Soron? These ribs are a mess. It looks like a tree fell on you.” Holti might be discreet about using magic, but he was a loud and gruff man. Harassing Soron over his wounds was a favorite pastime. With the colorful and long history of battle that Soron possessed, Holti had plenty of practice teasing Soron about wounds as he fixed them. “No trees, just a hungry yeti,” replied Soron. Soron swore, the honey mead tasted good but did little to dull the sharp pain Holti was inflicting on him. Sometimes Soron swore Holti hurt him more than any opponent. Soon the pain diminished as Holti used his magic to set the bones in their proper place. “There, all done. You will be good as new by morning,” said Holti, as he finished dealing with the ribs. Holti applied a bit of salve to the Yeti claw scars on Soron’s back then sent him on his way. As Soron left Holti stood there shaking his head, broken ribs and scars on his back. Holti could only imagine how precarious that battle must have been. Leaving Holti, Soron went to find his father. Soron had been gone for several months and would likely get an earful for being away. Soron returned to the Great Hall, the large lodge recently built to home the King of the North. Personally, Soron missed his old home, but the new lodge did fit the growing communities needs better. Soron knew his father’s gruff greeting was for show. If they had been alone his father’s greeting would have been more welcoming. But Theron took being king seriously, and tried not show his only son favoritism over other members of the tribes. The rest of Theron’s men gave Soron a much warmer greeting, they had no reservations about showing the young man how happy they were with his return. “I’ve been hunting,” replied Soron shortly. He had no desire to get into another argument about searching for Hexin. Theron wanted his blacksmiths building weapons not jewelry. Magnus Kollrson, leader of the largest of the far northern tribes, was a legend. It was said that he had slain over a thousand men in battle. His insatiable bloodlust normally had the man sailing to the west to attack the western isles. That he was traveling south meant only one thing. Magnus Kollrson had heard of the talk of Theron being King of the North and was coming to take the title. Everything Soron feared was coming true. “How many men does he lead?” asked Soron. “How many now follow King Theron?” asked Soron, knowing his father would pick up his distaste for the title. “A little over two thousand warriors swear allegiance to me, another five hundred of the Rennirson clans will join us, but that is all the help we can count on. The other clans are too far away or want nothing to do with fighting against the mighty Magnus Kollrson,” replied Theron. Soron had to give his father credit, he disagreed with what his father had done, but it truly had been for a good cause. Joining the local clans had already reduced the fighting among them. Unfortunately, Soron had been correct in his prediction of the move bringing the attention of the more war like tribes of the far north. Theron had little choice now. He would bow a knee to Magnus or fight to protect his people. After sleeping most of the day away Soron woke feeling much stronger. Holti was an amazing healer. Leaving his room Soron headed back to the large open main room of the Great Hall. It was supper time and Soron had been looking forward to this meal for weeks. King Theron sat at the head of the largest table. He watched carefully as his son walked into the room. The boy was already looking healthier than he had earlier that day. Theron was glad for his son’s return. Despite their arguments on the virtues of unifying the clans under one king, Theron valued his son’s council and no greater warrior could be found among his people. Theron was saddened that his son had to face death so often, but such was life in the north and Theron had to do what was best for all of his people. Soron would have to make his own way. As Theron pondered his son’s future he ate his meal. The meat tasted strange, not bad but like nothing he had tried before. Theron called for Rurik, the cook. Rurik, the portly cook waddled into the hall with an amused look on his face. Rare was the times his king called him into the hall to complain about a meal. Everyone knew not to mention Rurik’s cooking without a kind word. To do so was inviting a torrent of foul language and abusive insult that would make the most hardened pirate blush. Rurik was no one to trifle with, especially when it came to his cooking. “You called your highness?” asked Rurik. “Yes I have, you old goat. Are you going to tell me what I am eating or do I have to have some chop off your head for trying to poison me?” barked Theron. The king was the one person unafraid of insulting Rurik. Rurik smiled, enjoying the king’s discomfort for a moment longer before replying, “snow yeti, tonight’s meal is snow yeti.” A murmur went through the hall as everyone began to discuss the cook’s latest culinary creation. The cook smirked. “I thought you might say that. Now may I return to work?” replied Rurik. “Yes, but send another plate of meat out, I am going to have some more, this is a rare treat,” replied the king. Theron looked over at Soron, who was quietly sitting and eating while everyone around him talked about the unique meal. The content look on Soron’s face confirmed Theron’s thoughts. His son was the source of the meal. While Soron sat there enjoying his roast yeti, he pondered the dilemma of the impending attack from the great Magnus Kollrson and his five thousand men. Amradin was a small city but not one built for defensive purposes. The city had started out as a small village but had grown as quickly as tribes gathered under the strong and wise leadership of Theron Stoneblood. Magnus would destroy Amradin, simply to say he had. He would claim the title of king, not because he intended to lead the people of the tribes but because he could. Magnus Kollrson craved conflict, and if he had turned his attention to the tribes of this area he would cut a wide swath through the area, killing and pillaging before returning to his home in the far northern. Magnus must be stopped, thought Soron. When dinner ended and the majority of the people had returned to their homes for the night, Soron went and sat beside his father. In silence they sat there, watching the servants clean the other tables. Theron knew his son had something on his mind and would speak when ready, there was no point pushing him. “When this battle is over, I am leaving the north,” proclaimed Soron. Soron, one of the greatest northern warriors alive, living in the south among the farmers and berry pickers? The idea seemed preposterous to Theron at first but the more he thought about it the more it made sense. Perhaps among the more civilized and tame lands he son could find peace. “Okay, when this is done you head south,” replied the king. He doubted his words had any meaning but was glad to give his son some small piece of mind before they died. Having told his father of his plans, Soron left the hall and returned to his room. He would need his sleep. He hoped Holti’s boast of full health by morning was going to hold up. He would need to be at his best in the next few days. When Soron woke, he felt refreshed and better than he had in months. Holti had been true to his word. Soron looked carefully at his armor; he had grown weary of the well-worn leather and what it represented. With a sigh, he once more dressed for battle, wrapping himself in his form fitting leathers with his gauntlets and steel reinforced boots. His weapons of choice for battle were of his own design. Forged by his own hand, they were as fine of weapons as seen in the northern lands. His skills as a blacksmith were only surpassed by his accomplishments in battle. The dull black color of the blades was a byproduct of the unique northern steel, a productive only those with giant’s blood heritage could produce. The strength needed to forge the hardened metal beyond that of normal men. Soron placed his smaller sword breaker dagger in its sheath, tucked along his backside then place his larger weapon, his trusted sword in its carrier between his shoulder blades. Now armed and ready for what was to come, Soron slipped off to the kitchen for a quick breakfast and a small sack of supplies. When Soron reached the kitchen Rurik was waiting for him. Rurik always awake before everyone else to prepare the days meals was used to Soron sneaking in early. “I suspected you might be here this morning. Going off to challenge the mighty Magnus are you? Well good luck boy, if anyone can defeat him and save us from the blood shed it is you,” said Rurik as he handed Soron his morning meal and supplies. Soron nodded. The cook’s words echoed his own thoughts, that victory could only be achieved by removing the enemy’s vaunted leader. Without Magnus, the outcome of this battle was uncertain. If Magnus survived they would fall to the greater numbers of the far northern tribal warriors. “Thank you Rurik, for the food and the council. You are pretty wise for a cook,” said Soron with a wink and a smile. Soron had not known this about Rurik, it did not surprise him though. Rurik carried himself like a warrior, even when in the kitchen. “Perhaps I could join you in the kitchens when this is all over,” mused Soron. Soron smiled softly, “jewelry is not the work of a northern blacksmith,” he repeated his father’s often spoken opinion on the subject. “Actually I already told father that I would be leaving. He gave his consent, but it was halfhearted, he believes we will be dying soon so he said it to appease me,” said Soron. Soron shook his head, Rurik was a cagey one. He clasped the man’s arm in a farewell gesture then took up his sacks and slipped out of the great hall before the rest of the men started to awake. Soron took one last look at the Great Hall as he left. He wondered if he would ever be there again. As the morning sun slipped over the eastern horizon Soron swiftly moved north.